Seeing is not the same as noticing. I’ve been brunching at CHOW for three months and while I’ve seen Jesse Lockwood’s art on the walls, I didn’t really experience the work of Jesse J. Lockwood, or notice it until last week. Every day, we’re bombarded with stimulus, so we limit the information we take in. One of the ways we limit our “noticing” is through our personal filter of expectation. We see what we expect to see. The obvious example is pessimism vs. optimism. It’s a cliche, but it’s true. If you expect to see the good around you, your brain will find it. If you expect to see the sad and depressing, your brain will find that too. Sometimes familiarity robs us of our ability to notice. There are a million things you don’t notice on your daily route to work. Maybe you’re on auto-pilot, daydreaming or just simply somewhere else in your head. It requires an incredible amount of presence to notice the good on an often-traveled path. When CHOW was still new to me, I saw Lockwood’s art. I registered the colorful, fun, pop-culture-y pieces with Shepard-Fairey stenciling. Neat. 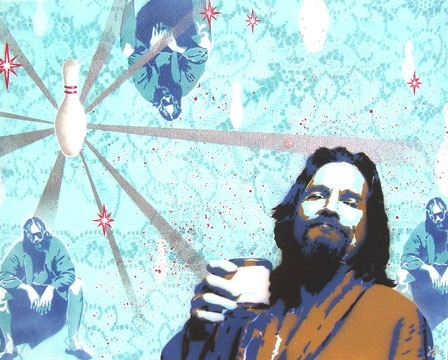 I only remember seeing his Big Lebowski pieces. I love The Big Lebowski (who doesn’t? ), so I glanced at the art, smiled, and continued devouring my hollandaise-smothered poached eggs. But then, last week, my friend Trek zeroed in on Lockwood’s art as something “Good in America.” Over breakfast, I took the time to really experience Jesse J. Lockwood’s art. I’d never noticed the vintage tennis rackets with images of McEnroe and Borg hanging in opposing corners in the main dining room at CHOW. Love. All I want for Christmas are these two rackets by Lockwood. They’re actual old-school tennis rackets with paintings where the strings would be. I mean, seriously. How rad are these? 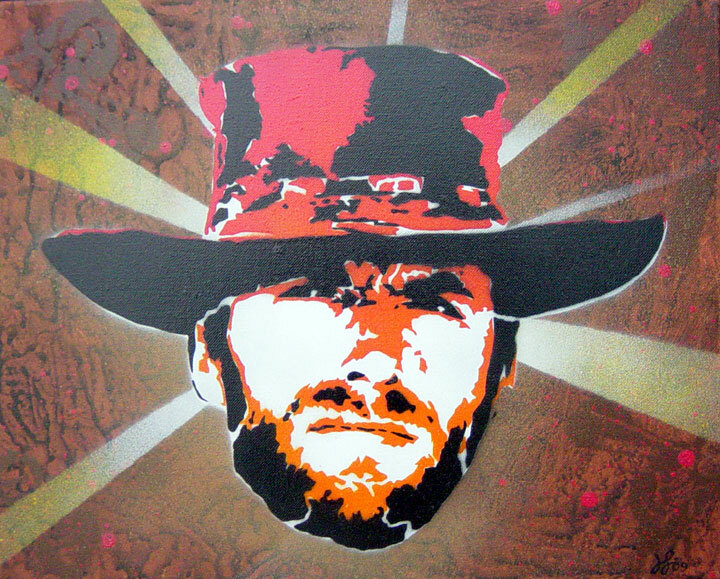 Someday, I’ll commission a Lockwood painting of Steve McQueen, maybe kind of like this awesome one of Clint Eastwood. So after I really noticed Lockwood’s art for the first time, I ended up in his living room, thanks to Trek’s Good in America project. Lockwood has a broad range of work, including a large body of trippy surrealist paintings with texture and dimension (think: gesso build-up and bird and rodent skulls). He’s also a high school art teacher, and has bright, personable son in grade school who proudly showed me all of his dad’s art, in every room (except the closets. Closets were off limits. Christmas is coming!). While Trek interviewed Jesse for his book, I sat on the couch talking to Lockwood’s third-grade son about his dad’s record collection, his trampoline, dogs (mine and his), the new Hobbit movie (he hoped to see it later that evening), the Life of Pi movie (he saw it the night before, and said he learned that life isn’t really that beautiful, but insisted he already knew that). It’s funny, but hearing the deep thoughts of a kid, sitting on a comfy couch in SW Bend, looking at art made me deeply aware of how beautiful life truly is, if we’ll just let it be. Oh, and if I haven’t already made it clear, my life would be even more beautiful with a pair of those Borg/McEnroe tennis rackets. Check out Lockwood’s website — see the “Tribute” section for more art like the pieces above. Then email Jesse and buy a holiday gift or two for your coolest friends. If you live in Bend, you’ve probably seen Lockwood’s art around town (maybe at Ranch Records, Astro Lounge, CHOW and LocalSlice) but next time, take a minute to really notice his art. You’ll be glad you did.